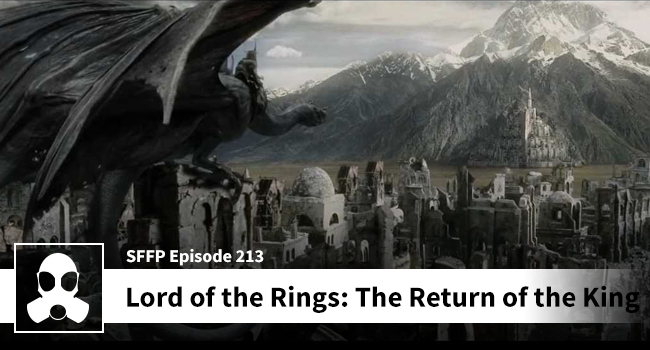 Dean, Jessica, and Matthew wrap-up their coverage of the epic tale of Lord of the Rings with a wild discussion about “Return of the King.” You are about to meet some interesting characters, from elven slave traders, to a Sauron hosted Barad-dur Shopping Network, to the infamous and notorious Jester, Pipituch. Come plow your way through outrageous and wildly immature jokes about Sam, Frodo, Boromir (of course Dean mentions him), Saruman, Smeagol, Eomer, Eowyn, Arwen, and every other character that you hold dear, and that we likely misspelled and most certainly mispronounced. RotK is an instant LSG Media classic.